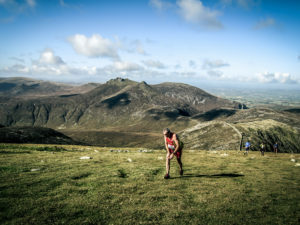 The 2013 Flagstaff to Carlingford Mountain race attracted a total entry of 47 runners of whom 46 eventually completed the course. The runners were greeted by a rare clear sky over The Cooleys and this along with more than reasonable underfoot conditions produced some really good performance depth throughout the race. Stephen Cunningham from Mourne Runners battled throughout with Deon McNeilly of Newcastle who led during the early stages to the Windy Gap and was still leading by a small margin as they crested the ridge and disappeared into the Slieve Foy wilderness. Cunningham sealed his race victory with an excellent downhill run from checkpoint 6 on Slieve Foy and at the finish recorded the excellent time of 1 Hour 35 Minutes and 10 seconds. Deon wasn’t far behind in another fine time of 1 Hour 37 minutes and 6 seconds. These were the only sub 1:40 times but no less than 16 runners bettered the 2 hour mark with 24 under 2:10 and 30 under 2:20. In total 41 athletes finished under two and a half hours which might well be a record for the race – over to the statisticians to decide on that one. The leading 4 at checkpoint 3 were Deon McNeilly, Stephen Cunningham, Seamus Lynch and Neil Carty. At the finish Stephen had moved up to first while Neil moved into 3rd but these 4 had the race sewn up between them at this early stage. Led by Diane Wilson of Dromore this was possibly the best ever women’s race with Diane recording a superb time of 1 Hour 57 minutes 53 seconds which was almost a 5 minute improvement on last year and placed her 14th overall. Shileen O’Kane the current record holder was next home in 2:03.18 with Ann Sandford 3rd in 2:16.18. Mourne Runners with a points score of 14 points were clear-cut team winners but it was touch and go between Ballymena Runners on 23 points and Newcastle on 24 for 2nd & 3rd. Lagan Valley Orienteers finished a complete women’s team scoring 77 Points to come 5th overall with BARF on 64 points in 4th. Many thanks to the Armagh AC marshalls – Lorcan Vallely Checkpoint 1, Padraig Muldoon, Brian Vallely & Jamesy Vallely checkpoint 3, Jim Finnegan and Gerry Hughes Checkpoint 4, Kris Muldoon Checkpoint 5 and the Vernon brothers Brian and John Checkpoint 6 Slieve Foy. Billy McNeilly was chief ‘bottle marshall’ at the Windy Gap and Ricky Cowan helped get the prize giving off the ground. Special praise has to go to the Vernons who stayed at their post through the driving sleet and freezing conditions that enveloped Slieve Foy for the last hour. However their concern was to ensure the safety of the two women runners coming in an hour behind everyone else. The Vernons didn’t leave the summit until they saw the women safely on their way down. Lesson learnt is that the cut-off at the Windy Gap is maybe a bit lenient and will have to be looked at for 2014 in the interests of everyone’s safety.